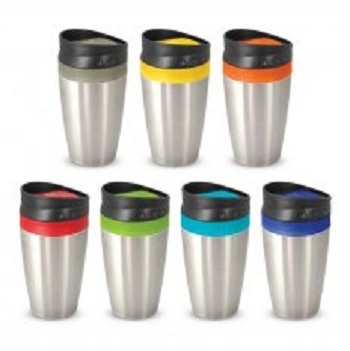 "Grab this personalized trendy 350ml reusable cup with double wall construction from vivid promotions Australia. It has a stylish stainless steel outer wall which will keep coffee hot for the longest time. It is the perfect promotional gift for frequent travelers. Some important features- Item size: Dia 75mm x H 155mm Decoration: Pad Print: 30mm x 45mm (square) Laser Engraving: 22mm x 40mm Material: Carton Dimensions: 45 cm x 36 cm x 36 cm Carton Quantity: 40 pieces per carton Minimum Qty: 50 Visit our website at vividpromotions.com.au for more products and further information."